Loubert-Hudon, A. and Matton, D. P. (2013). Ovule Clearing Method for Solanaceous Species. Bio-protocol 3(21): e951. DOI: 10.21769/BioProtoc.951. Depending on the species, embryo sacs can be difficult to observe. Ovule clearing allows precise observation of whole tissues under Differential interference contrast (DIC) microscopy. The use of Methyl Salicylate as a clearing agent has proved to be particularly reliable for Solanaceous species. Carefully collect ovaries from flower buds or flowers at anthesis with precision forceps. During the process, keep ovaries and flowers on ice. Figure 1. Organs and cells types of Solanaceous species’ flower and female gametophyte. a. Longitudinal sections of a Solanaceous flower. b. Transversal sections of a Solanaceous flower. c. Description of ovule cells types and their visualization in cleared ovules (false colors are used to emphasize cells types). To facilitate penetration of the fixative and clearing solutions, the pericarp has to be removed. Under a magnifying glass, cut the top of the ovary’s pericarp with precision forceps or scalpel to allow its removal (see Figure 2). Figure 2. Steps by steps procedure to remove the pericarp of Solanaceous species. a. Collect flowers at the desired stage of development and keep them on ice; b. Remove the upper part of the flower carefully by hand to keep only the ovary still attached to the pedicel; c. d. Cut the top of the ovary’s pericarp with precision forceps or scalpel to allow its removal; e. f. With the precision forceps, pinch under the bunch of ovules and put them directly in fixative solution. A bunch of ovules can then be carefully taken and fixed in FAA solution overnight. Gentle agitation at 4 °C helps to homogenize the fixation, but is not crucial. The day after, fixed ovaries are incubated in 95-100% ethanol for at least one hour, still with gentle agitation at room temperature. The ovaries are then transferred in increasing ratio of Methyl Salicylate/EtOH solutions for 30 minutes each (1:3, 1:1, 3:1) at room temperature. Again, gentle agitation will help, but is not crucial. The tissues are afterwards left in 100% Methyl Salicylate at room temperature. Make sure the tubes are well closed to avoid Methyl Salicylate evaporation. The ovule can now be observed under differential interference contrast (DIC) microscopy. To avoid crushing the tissues, printed coated slides with wells are very useful. With precision forceps, carefully separate the ovules on the slide. Methyl Salicylate (100%) is used as mounting solution and slides are sealed with clear nail polish. Note: It can be prepared in advance and stored at room temperature. This protocol is adapted from Chevalier et al. (2013) and Estrada-Luna et al. (2004). Chevalier, E., Loubert-Hudon, A. and Matton, D. P. (2013). ScRALF3, a secreted RALF-like peptide involved in cell-cell communication between the sporophyte and the female gametophyte in a solanaceous species. Plant J 73(6): 1019-1033. Estrada-Luna, A., Garcia-Aguilar, M. and Vielle-Calzada, J. P. (2004). 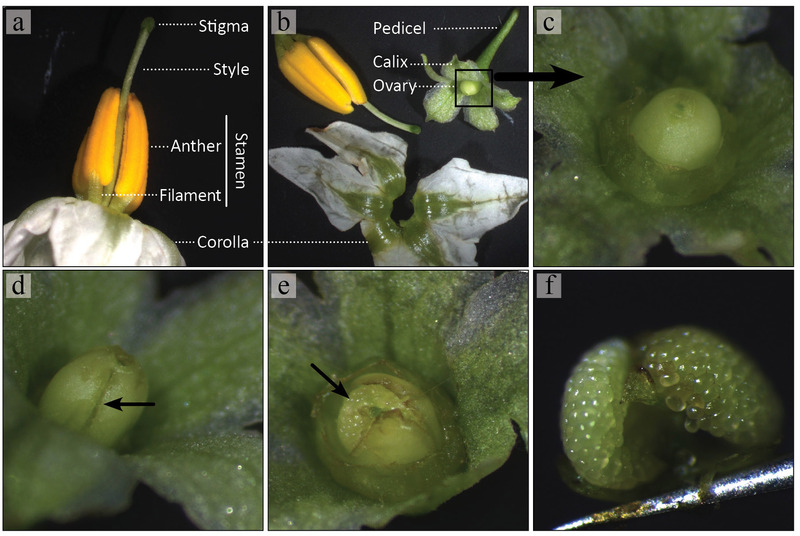 Female reproductive development and pollen tube growth in diploid genotypes of Solanum cardiophyllum Lindl. 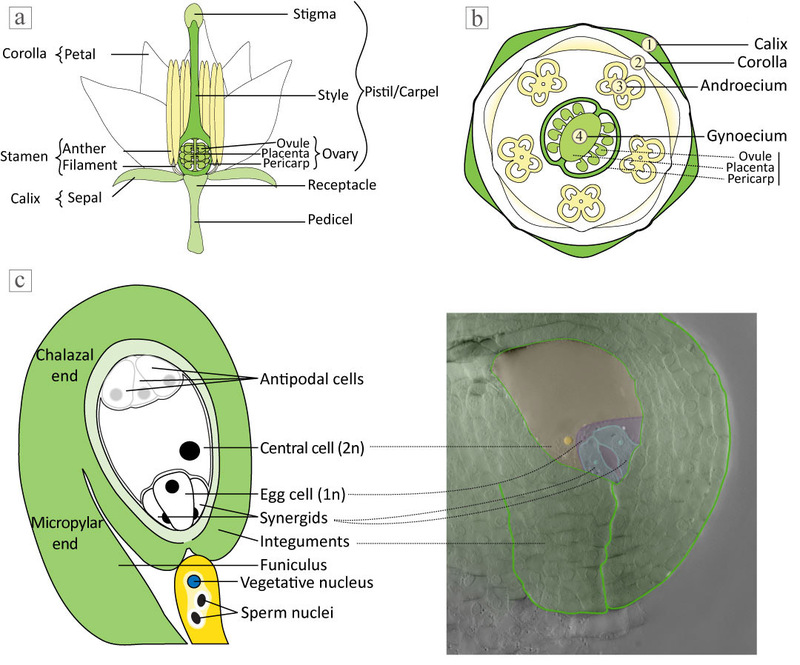 Sexual Plant Reproduction 17(3): 117-124. How to cite: Loubert-Hudon, A. and Matton, D. P. (2013). Ovule Clearing Method for Solanaceous Species. Bio-protocol 3(21): e951. DOI: 10.21769/BioProtoc.951.